I have meditated. I've done Tai Chi, Qi Gong, Kung Fu, DahnHak, Pranic Healing, Tensegrity and Access. I've been healed, acupuncturized, massaged, rebirthed, exorcised and hypnotized. I've done the Scientology advanced levels. I'm an NLP master. A Certified Clinical Hypnotherapist. I'm an energetic healer. I've seen hundreds of past lives. I have had out-of-body experiences, I've done astral traveling. I've been abducted by little grey aliens. I've talked with dead people. I've met my future selves. I've channeled, done automatic writing and psychic readings. I've seen the beginning of the universe, and the end. I've bent spoons and walked on burning coals. I've watched UFOs over Area 51. I've seen shamans and psychics and channelers. I've gotten all my questions answered. I came from Arcturus and I spent some time in the Orion Empire. I've talked to crystals, gotten aromatherapy, ayurvedics, color therapy. I only use holistic health care: naturopatics, homeopathy, herbs, oriental medicine. My DNA is supposedly evolving to 12 strands and I'm well on my way into the 5th dimension. I've gone to hundreds of rituals and danced, chanted, drummed and prayed. I've gone to sacred sites, feng shuied my house. I've gotten my horoscope analyzed many times, my numerology has been done, my palms read. 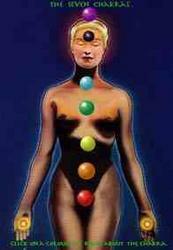 The tarot has given me valuable insights, and I know what shape my chakras are in. And there's probably a lot more I'm forgetting. Now, to a New Age person all of that is rather normal. Not even particularly impressive. Most people who've followed some kind of metaphysical, spiritual, new age type of path for a number of years will have done a lot of this, and a lot of other things I didn't happen to run into. And what is cool is that if I recognize somebody else as what can be loosely identified as a New Age Person, we can talk about any of this, and they will most likely not have any reservation about sharing experiences and insights. I don't have to prove anything, and it won't even be an issue. They will measure the truth by what it feels like. But yet I'm also a bit tired of the New Age. Oh, I'll happily talk about any of this, and tell you what I think worked or didn't work, and why and how. And I enjoyed all of it. But my perspective has changed somewhat. I'm more focused on ordinary everyday life. I'm more skeptical. I'm more interested in keeping a little bit of a distance to the multiple possible explanations for why things are the way they are. I'm interested in bridging different realities and world views. While I live the life that is in front of me. Which is often quite ordinary, sometimes hard, and usually not particularly fantastic. The New Age became a little too mainstream at some point. Where before it was a bit of an underground activity, pursuing experiences and wisdom out of the ordinary, where the rest of the world was really rigid, limited and analytical. But somehow it became something more watered-down, commonplace, lacking distinctions. So that New Age for many became synonymous with flakyness and lack of critical thinking. Or it became synomynous with "anything goes" and that any weird idea or practice is equally valid as any other. And it all became a good deal less useful. So, personally, I will continue to stretch the boundaries of my existence, and I will continue to choose the tools in my life that work, even if others think they're strange. But I'll probably evaluate things one at a time, and certainly avoid assuming that I'm part of a group that all shares the same views. Life is a rather fantastic thing in the first place. Full of experiences and possibilities and insights. They might be small or large, deep or shallow. But you don't really need to invoke any fancy belief system to talk about it. The experiences and what you think and feel about them might be enough. And of course you can notice the patterns that link things together. But part of my different perspective is that I try to avoid having all the answers in advance, and rather keeping my mind open to the newness of things. Now, as I write here in my blog, my new agey friends, or friends from specific metaphysical traditions, might well be puzzled that I wrap things up more than they would expect me to under other circumstances. I.e. I write a lot more conservatively and tentatively than I might otherwise. Referring sort of distantly to news items and books with interesting but theoretical subjects. Where I could just as well provide the straight dope. It is just that I don't necessarily think the dope is quite so straight as it might have seemed. And I no longer claim to know exactly what it is. And then my more 'normal' friends might be puzzled that I sometimes write about strange hocus-pocus subjects. Borderland weirdness, unproven pseudo-science, conspiracy theories and general superstition. And I might well lose some of them, if they expect that I should just write about RSS Aggregators and blog programming. But I guess I can live with that. I write about whatever I feel like. But my compromise is that I try to write so that multiple types of audiences might read it. I do believe it is possible to both be authentic and well-balanced. So I both attempt to write about things I feel the urge to write about, whether it is likely to be generally accepted or not. But I also try to frame what I say in such a way that it might better be understood by more people, and so that I reasonably well can stand behind what I say. I guess what I'm trying to explain is why I'm writing less new agey than you'd expect. Or more new agey than you'd expect. Depending on who you are. I believe in what I've experienced, what works for me personally, what makes sense, and what I can defend logically. And I keep an open mind to adopting something new that comes along if it proves to work better, or reject it if it doesn't. For some that will mean I'll believe in some outrageous things. For others that my views are pretty tame. I COULDN'T HAVE SAID IT BETTER MYSELF. SMIRK.... YES, THAT'S THE CHANGE. THE CONFORMITY, THE EASY ANSWERS LIKE 'THAT'S YOUR LESSON' AND HOW EVERYTHING IS ABOUT THE LEVELS... WELL, SOMETIMES IT IS AND SOMETIMES IT AINT. THERE'S SIMPLY NO TELLING ANYMORE. GOTTA LIVE IT, EXPERIENCE IT... AND BE PREPARED TO NOT KNOW. Don't feel to worried about your audience ! Oddly enough, one of my main focuses is blogging about a Global Brain that is a sort of hive mind for all humanity. And I don't think of myself as new agey, if anything the skeptical explanation for many paranormal claims makes more sense to me after studying the evidence than any other. Talk about synchronicity though, I keep rereading the comment above this and discovering more and more similarity the more I think about it. ....to take or not. From what I observe of you, you seem to get bored with things quite quickly. As soon as you have "got" it, you lose interest and want to move onto something else. Which means you are always interested in new things, and the pace at which you absorb new things that quickly become old accounts for your vast range of styles and interests. This too, will not last. :-) Put another way, you are the Infinite experiencing as many viewpoints as you can, and that's cool. Please. Write on and I'll read on. It's just a label, anyway. Thanks for the comments. Yeah, maybe part of it is that I get bored with things and move on. And I'm usually quite happy even with the things I got bored with. But I'm compelled to keep looking. Currently I'm more inclined to look at things in emergence, global brain, patterns and systems terms. And look at life with a sort of zen practicality. None of which necessarily changes anything. But they're somewhat easier to talk about with a wider audience. I'm a bit more on the skeptical side too. Which means I'm skeptical about skeptics! My gut feeling is today's science hasn't discovered everything, there are "models" in our brains that keep changing (until they cease to change or until they disolve, whichever comes first), and there's a nicer way forward if we put effort and "tricks"/skills (thinking, trial and error and learning, etc) into it. There's the experiences, there's the memory of experiences, and there are explanations. Explanations are explanations. People are people. I tend to like people. More so when they don't just act like explanation-displays. Heheh, yes, that's a fun but useless process there. "Try not to think of the word 'badassmotherfucker'! ", "Now do it again!". Its the 'unks' 'unks' 'unks' that make the journey so rewarding - thanks Flemming - for a beautiful piece. Keep it going ... we're hearing you ! For me,the ordinary things of daily life, including the unpleasant,are the most wonderful.Just the fact of anything existing at all, rather than nothing opens the door to wonder, and puts life in joyful perspective. and what does it profit one to be honest....??? the sake of guise and disguise.....and ??? So, you're taking up real estate? Maybe stamp collecting. Or croquet. Yeah, a lot of people are uptight when the shakey foundation of their beliefs is being poked at. Whether their belief pretends to be based on science or religion or primetime TV. But if we can manage to understand that we're all looking for workable wisdom and trying to understand life and the universe, we might actually get along very well, even though we might be starting from different angles. I appreciate your honest attempt to be real, and also to be flexible. It seems to me that rigidity can often lead to cracking and crumbleing. If, however, you go only by what you experience and go only by what seems to be working better does it not leave you vulnerable to aimless wandering in life? Sometimes it is nice to just get in the canoe and drift with the breeze and the current. When there is a storm (and life provides many storms) would it not be nice to have a trusty paddle to go back and rely on? Often a standard or a plumb line is necessary in order to avoid errors in building so that we don't build a crooked house. Yes, that's a good way of putting it. You're right, it is very nice to have some kind of tools or guidelines ready for when you find yourself in a storm. I suppose what I'm trying to do is to find the most true and eternal guidelines. Sometimes that means I've rejected a tool which really would be handy to have in a storm. But because I moved on from the previous system, I might also synchronistically just have found something that serves me really well at the time. Or I find that if I take a fresh look, there actually IS some eternal principle that I already know well, and which I never threw away, and which actually fits the circumstances perfectly. Mostly I'm trying to be in tune with my own inner compass, as opposed to carrying around a book I need to look in to know what to do. I wouldn't want to be without a compass at all. Internal compass is an interesting thought. By that do you mean something that is unique to yourself, but perhaps different from that of those around you? It occurs to me that sometimes we are accustomed to thinking of ouselves as individual islands, when perhaps the reality is that we are more like a fleet of ships. We are certainly independant, but there are others around us and what we do affects them too. This being the case, it requires some sort of common compass so that as we travel through life we are not traveling aimlessly and slamming into others around us. I find that my internal compass can become so scewed by emotion etc. that it gives unreliable readings. I need some consistent, reliable and objective standard with which to compare. The way I believe it to work is that there's something deep inside of us, which we can find if we stop thinking so much, and stop dwelling in superficial emotions. Something which is both more uniquely us, individually, and also, paradoxically, plugged right into the whole that all of us are made of. So, the urges and automatic thoughts and reactionary emotions, which is probably what most people notice first, is probably more likely to just be unconscious rehashing of what has been read in from the surrounding world. Just regurgitated fears and reactions and incomplete information. And, yes, they're generally a bad compass. But somewhere beyond all of that I think there's a compass that never really fails, and which isn't subject to petty obsessions, but which always knows the truth. I am a bit confused as to your point. Does the notion of "stop thinking so much, and stop dwelling in superficial emotion" not contradict what you stated originally which is: "The experiences and what you think and feel about them might be enough"? Hahah, good point! Let me, eh, think .... They're referring to somewhat different things. In that "the experiences and what you think and feel about them might be enough" I'm speaking out against having to have a big belief system and a body of abstract knowledge to go with experiences in your life. Living in itself is a good thing, and sometimes being fully in the moment is more useful than always cross-referencing everything with a set of beliefs one is carrying around. So we're talking about something *real* versus something several steps removed. And we're talking about being *present*. In my suggestion to "stop thinking so much, and stop dwelling in superficial emotion", I'm not being against perceiving the world, and observing what is going on, and being conscious of one's experience. On the contrary. Words easily get in the way. What I'm trying to do is to make a distinction between different kinds of feelings, different kinds of thought, different kinds of consciousness. And I'm judging some of them more negatively - the ones that are more based on reactions, fixed ideas, stuck emotions from the past, obsessive thoughts going in circles. I judge those to be less conscious, less sane, or whatever words we attach to it. And then there's another way of doing it, or rather of *being*, which I judge to be more useful or sane. Which might involve feeling things, and it might involve having thoughts about what it means. But it is in the moment, in the present time, and it involves being very attentive to what is going on right now. As opposed to cross-relating it with lots of things from the past or the future in order to arrive at what it means. Am I making sense? It is a bit difficult to talk about because words like "thought" or "feeling" might mean quite a wide variety of things. One way of putting it is that there are various levels of abstraction, further and further removed from primary experience. Already when we've put an experience into words, we've lost a good deal of what it really was, over-simplifying it in order to fit it into the words that are available. And then when we try to categorize it into being one named kind of experience or another, we're letting go of even more detail, in order to easily communicate abstractly. Which is good and useful when we need to share ideas, but, generally speaking, real life is found by going the other way. And, while there's great use in communicating abstractly in order to share knowledge, it is more risky to do the same with feelings, particularly negative emotions, which might end up creating a lot of havoc if generalized and applied out of context. nourish the soul. Perhaps I will stick to the Bread of Life and the Living Water. No problem. ... Ah, I see from your site that you're more coming from a Christian perspective. Which might explain why it doesn't quite click for you what I'm saying. Which is fine. It doesn't have to. But if it helps anything, the primary experience I'm talking about points to something, an underlying unity, we could well call "God", or "All-that-is". Or the "quantum field" or the "Omniverse". I prefer just calling it something like "Life" or "Being" and I'm not fond of anybody's attempt of codifying it into a book or a set of static beliefs. I prefer being in touch with it myself, and I don't particularly antropomorphize it. ... a bit of a delayed visit to this thread, but I've noticed that a lot of my friends who might have previoulsy seen themselves a a bit New-Agey are, in some measure either growing up, moving on, or otherwise evolving. And I have to include myself in this too. I'm more interested in spiritual (and earthly) pragmatism these days than being concerned about whether or not I'm Adcending, have Ascended, amd going to be 'beamed up' soon etc. * 1 What do chromotherapists do?